From past to present, a wedding is an important ceremony for a lifetime, marking the turning point of entering marriage and family life of the couple. In times of peace or war, the face of the couple reflects happiness looking forward to a life filled with emotion. We bring back ancient history of attending a simple wedding, rustic but happiness permeating throughout just as on this old projected image below. 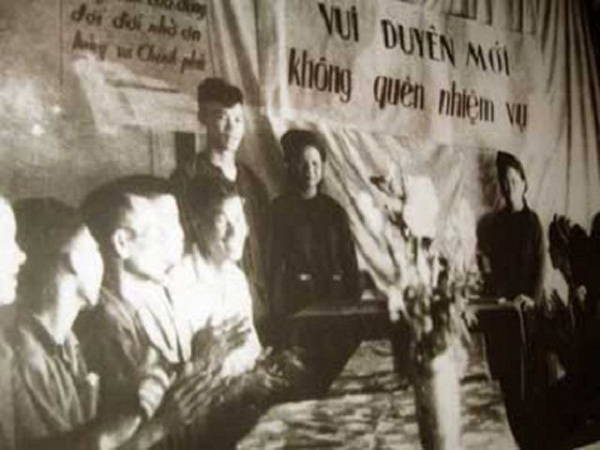 The text for the background is not the marriage words but it’s the national flag, the image of Uncle Ho with the slogan: "Fatherland above all, frontline first", "Please do not forget the charming new task"
The groom in uniform; bridal white shirt, black silk pants, arms bouquet lay-thanks.Although there are many difficulties when new country unification wedding peacetime but also be considered complete, richer. Wedding Apparel in peacetime more sophisticated wartime: bride in white robes, wearing chiffon add on top; groom wore com-ple. Font names include simple wedding bride - groom, the words "One Hundred Years of happiness" and the image sometimes flying pigeons are cut by hand. Wedding subsidy period but casual but always brings with eagerness, frolic of children with multiple blessings from neighboring villages. Image of Super Cub cars appear in the wedding the groom's family demonstrated in the form of well off, there's food to. Happy young couple of Hanoi through the lens American photographer - David Alan Harvey. Photo taken in 1989. Room wedding bride, groom colorful decorations.